Since childhood my passion has been radio and public speaking. I was inspired by my own father who was a public announcer. I was always intrigued about becoming a radio host or working some form of communications job. As an adult, while forming a family, whom I love very much, I worked very hard to make sure we could progress to succeed in the “American Dream,” but I always felt I could do more. So I took it upon myself to further my skills and revisit and rekindle my passion for telecommunications and radio/public speaking. I took a few courses on public speaking and audio engineering while working. I wanted to prove to myself I could do both: work a job and follow my passion for radio. Since then, I have worked for three different radio broadcast companies over the course of 10 years. My passion for this career has grown and the public I work with has accepted me with kindness and it seems to grow more every day. I love working for my listeners. 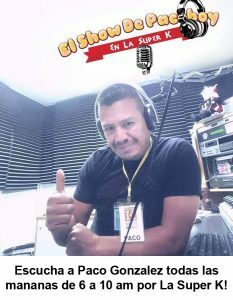 Not only am I honored to be a DJ here at La Super K, I have been able to be the voice and an active member of the Hispanic community and that, I feel, is the greatest honor as a public speaker/ DJ. I believe that we all have a goal in this life, whether it be small or big and we strive to complete it. I make it a mission to complete it every day, not only at the radio station, but in my family and my community. In my career as a radio DJ, I have been awarded and recognized within my community and by employers for my participations and achievements. But I believe the most beautiful thing about this line of work is the ability to touch people’s hearts and get feedback from your listeners. I like to motivate my family and others in my free time. I enjoy exploring nature and creating memories with my family. I love picnics on the weekends and as well as fishing with my sons.